AC Milan starlet Lucas Paqueta was officially unveiled by the Italian giants on Tuesday and revealed he hopes to follow in his idol Kaka’s footsteps. The 21-year-old has joined the Rossoneri from Flamengo in a reported €35m deal, as per Sky Sport Italia, and will potentially be in line to make his debut this month. Although it’s far too early to make any comparison between him and Kaka, the similarities in terms of what they can offer the team and the fact that they both joined Milan at a young age moving from Brazil, it makes it easy to see why it is being made. Nevertheless, Paqueta will be desperate to make a name for himself and as noted in his comments below, he was eager to insist that he’s determined to repay the faith shown in him by the Serie A giants. Kaka enjoyed two spells with Milan, the first of which was between 2003 and 2009 as he guided them to a Serie A title and Champions League success along with other major honours. In turn, coupled with the 95 goals that he scored in 270 appearances, there is a long road ahead of Paqueta to even be considered on that same level, but the Brazilian starlet seemingly had no doubts about making the move to San Siro when asked why he chose Milan. 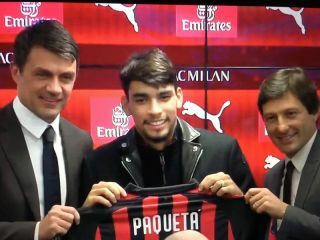 Paqueta was also asked whether or not he was familiar with his new coach Gennaro Gattuso, who himself enjoyed an illustrious career for Milan and played a key role alongside Kaka during the club’s last golden era. Time will tell if Gattuso can now help his development and ensure that Paqueta becomes a fundamental figure in Milan’s long term future as they’ll hope he can also make an immediate impact and help them secure Champions League football for next season.